I only post this in the hopes of answering some of the up and coming emails in the next few days regarding the image you see on the left. No, it is not doctored or photoshopped in anyway. And no, the sky near the center and the outskirts of the storm are not blood red. The meteorologist software places the colors there to show severity so as to have a better way of warning people in the path of the storm. Living in a tornado prone region I know too well what those colors mean and I must say I would not want to be in that area when that kind of wind hits. I do not nor ever will ascribe to the Roman Catholic mindset that in every image is believe some sort of spiritual or demonic manifestation of some patron saint or actual demon. But the majority of the people in Haiti do in fact live their lives in this Vatican inspired realm. 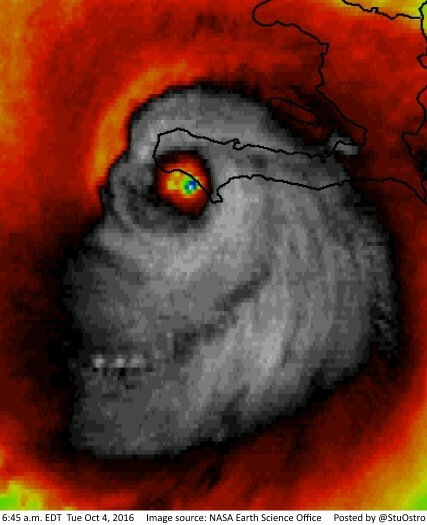 That being the case, I expect this picture is about to get a LOT of air time as well as numerous opinions thrown about as to why it appears to look like a human skull with a demonic grin and hellish eyes as it heads into Haiti to do some massive damage. On the other toss of this wind-blown coin, we must understand that many people in Haiti are in fact deeply ensconced in Voodoo Magic and the open and obvious worship of demons. But then like most Catholic nations, wherein 85% of the population is Roman Catholic, this is to be expected. Worst yet, Satan also know this because he is the dying god of Rome and all nation in bed with Rome. And Haiti is the epitome of Catholic loyalty. And so, I am sure some Catholics and even Haitians in and outside of the fallen church will declare this demonic picture of the hurricane that slams the daylights out of them is to be a manifested sign from Heaven that God's judgment has fallen upon Haiti for her many sins. Truth is, do we need a facial expression of a demonic face to tell us any of that? For Catholics, yes, they need such things as Catholicism is designed to exemplify the creature above the Creator. (See Romans 1:22-32) Hence the reason they have so many statues, relics, pictures, prayer beads, icons and manifestations (so they think) of everything from the face of Jesus in a tortilla shell to hurricane Matthew's demon face. We not only need to pray for these spiritually poor souls, we need to share with them what the Word of God says about Jesus and His love for them. Praying to statues, worshipping tortillas or uplifting radar depictions as a sign from God is not how we glorify God. That is how you glorify Satan and his many demonic images. As Christians that read Bibles, all we need are eyes that see he truth in God's Word as it pertains to live in this world. We do not need a demon faced radar depiction of a hurricane to tell us that Haiti is a nation in spiritual and eternal danger. Their demon worship as well as Papal worship says that rather boldly. Be it Voodoo, homosexuality, Papal worship or something as strange as political correctness that allows for all sorts of sin, all nations today are in grave danger of being lost for all eternity because all of them, and not just Haiti has their proverbial storm headed their way. It's called the seven final plagues and they are on the very near horizon! .